A NEW INTRODUCTION OF TERRA NOVA NURSERIES, INC. USA. Brunnera macrophylla ‘Alexander’s Great’® has been protected by breeder rights in Europe and the USA. 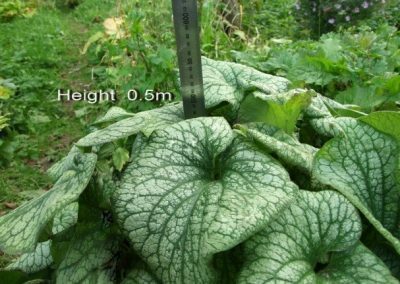 Brunnera macrophylla belongs to the group of so-called harsh-leaved plants, the Boraginacea. The plant is named after Samuel Brunner, a famous botanist and plant collector who was born in 1790 in the Swiss city Bern. Samuel was a widely-travelled person. Many articles about his botanical trips have been published. He passed away in 1844. Brunnera macrophylla also known as a synonym of Anchusa myosotifolia, is originating from the Caucasus and native to Siberia, and that’s why the common name is Siberian bugloss or false forget-me-not. It is also called the hardy Myosotis. The name bugloss comes from two Greek words, meaning ox and tongue. It describes the approximate shape and rough texture of the leaf. If one has ever felt or have been licked by an ox tongue(cow) it easily can be understand why it is called harsh-leaved plant. This texture makes the plant quite undesirable to deer. 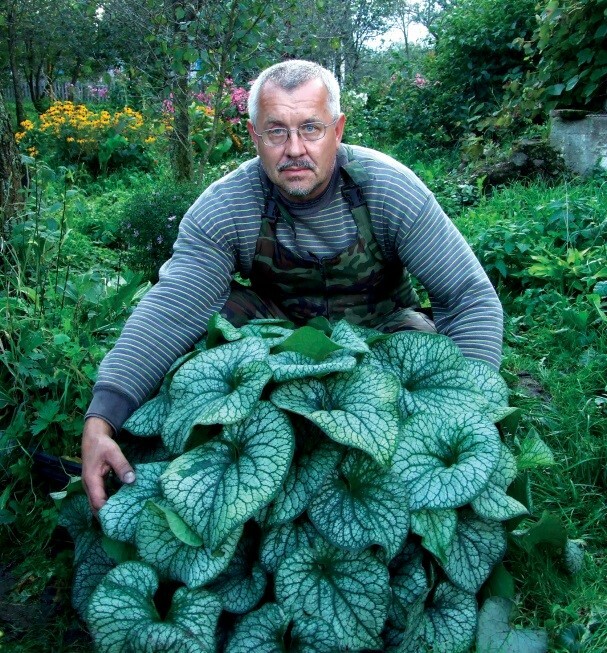 Brunnera ‘Alexander’s Great’® was bred by the renowned, Belarusian plant breeder, Alexander Zukeivich. 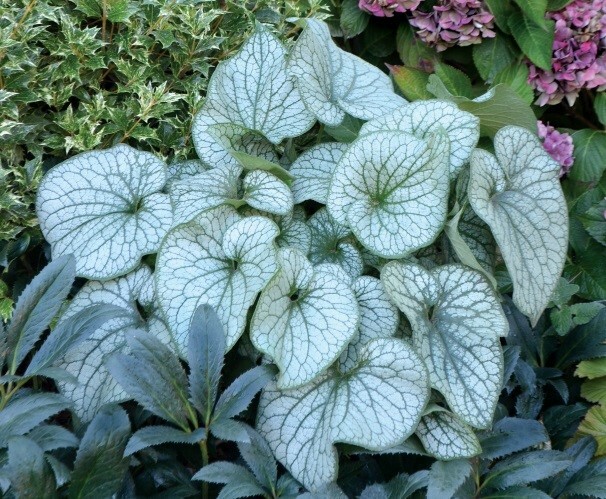 Brunnera ‘Alexander’s Great’® has gigantic leaves that form a bushel-basket of silver-flecked foliage. Sure to be a showstopper in landscapes and containers this Brunnera is poised to capture the attention of growers across the globe. 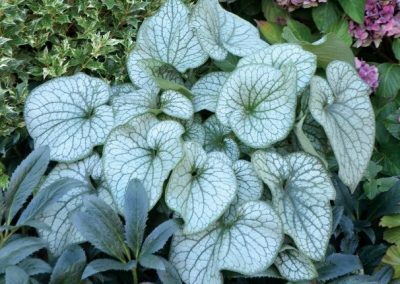 Brunnera ‘Alexander’s Great’® has extremely large, white-veiled leaves and produces blue flowers in spring with sporadic summer blooms. 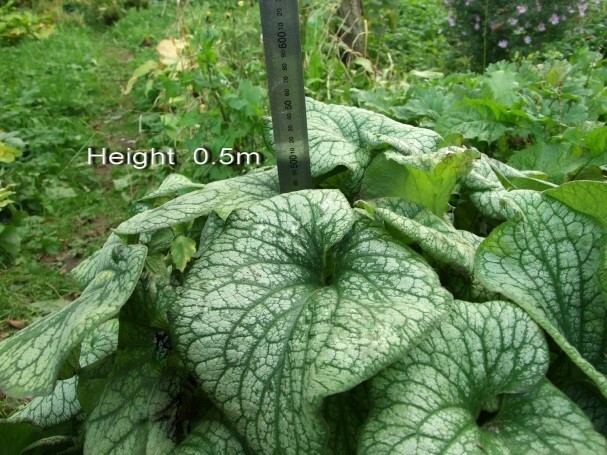 Compared to the popular Brunnera ‘Jack Frost’, it has much larger leaves and a bigger plant size. The average diameter is 70cm. A very hardy, showy and easy perennial. Brunnera is a classic garden plant that add a bit of nostalgia and charm to the garden. 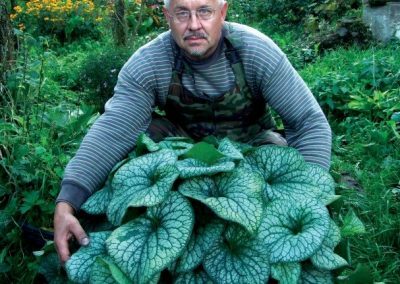 It is no wonder that the garden architects, with a close bond with the nature, do love Brunnera. Brunnera macrophylla ‘Alexander’s Great’® will amaze and rejoice gardeners for giving so much pleasure without demanding much in return.